We stock a range of unique, attractive insect feeders and habitats that are constructed from durable, solid FSC timber, designed to encourage beneficial insects like ladybirds, lacewings, butterflies and solitary bees that are gregarious and safe around children and pets. Beneficial insects like ladybirds and lacewings eat aphids, scale insects, mealy bugs and spidermites, reducing or eliminating the use of chemical insecticides used in your garden saving you both money and time, whilst butterflies and bees help pollinate flowers, fruit and vegetables and may increase the yield of both fruit and vegetables in your garden. 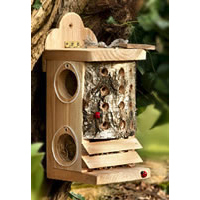 Insect Feeders: 5 stars out of 5 based on 0 user reviews.